Film - Memento (2000) - Think backwards.. There are some films which challenge your ability to concentrate, listen and understand beyond what your eyes see. There is one of the greatest artists in Hollywood, who creates and directs such Mind-Baffling films. He makes you watch every second of film carefully. He deceives eyes and ears of the audience. He has directed all-time greatest mystery-thrillers in World Cinema. Some of the examples are Batman Series, The Prestige (2006), Inception (2010), Man of Steel (2013), Interstellar (2014) and The Title of this Blog. He is none other than acclaimed writer-director, Christopher Nolan. 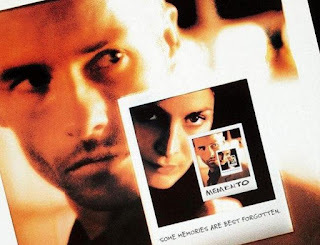 Memento is Nolan's trademark film, which would ask audience's 200% involvement for every second of film. Nolan had once said that Television channels avoid films which don't follow "Pizza delivery scenario". Pizza delivery scenario is "If a pizza arrives while you're watching TV, you have to answer the door, deal with the man and then be able to get straight back into the story, having missed three or four minutes. And even you could understand or predict missed pieces". I have to tell you that Memento doesn't fit into "Pizza delivery scenario". You have to pause the movie, even if you have to have a glass of water. Leonard Shelby (expertly played by Guy Pearce) is a former insurance investigator saddled with a peculiar and devastating mental condition: A blow to the head, as he was grappling with the men who raped and murdered his wife, caused him to lose the ability to create short-term memories. So, while Leonard can remember everything up to the blow to the head, he remembers anything that happened after for no more than a few minutes. Determined to revenge his wife's death, Leonard compensates with an elaborate system that includes notes, photographs and, most bizarre of all, key information tattooed on his body so he can read it in a mirror. Every film has to follow certain storytelling style (i.e. present tense,flashback, narrative or mixed). Memento has a storytelling style, with events chronologically reversed. That means, the first scene of the film is the climax and then story goes backwards, telling us what happened before each moment. We can understand, how much risk was involved in adopting such style and Nolan accepted it. 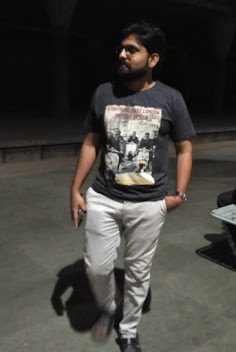 Even he had struggled to get a distributor for this film, as each distributor was having the perception that nobody would like to watch such film. But after release of the film, it was critically acclaimed by audience all over the world. At first, Nolan had considered renowned actors such as Aaron Eckhart, Brad Pitt, Charlie Sheen and Thomas Jane for the role of Leonard before Guy Pearce got the part. and he equally nailed the character of Lenny. This is definitely, a movie which can be called as "Must watch before you Die". 1. Don't watch this film, while you are feeling sleepy or not fully awake or in hangover (:P),or already disturbed with other work. 2. If there is something that could interrupt film, "Pause" it (Don't miss even a second). 4. Please see scene at time 1Hr:30Min:05Sec... It is biggest mistery revalation point induced by Nolan. Hats off for that.